MedCost has been in business since 1997, specializing in analytics, negotiations, auditing and complete spend management for the non-acute market. Since our inception, MedCost has saved our clients thousands of dollars as well as countless hours of time. Enjoy the highest service level and very best pricing by outsourcing your purchasing to MedCost. We do the work, you enjoy the savings! There is a significant difference between belonging to a GPO and knowing how to effectively use GPO contracts. A Group Purchasing Organization (GPO) offers valuable services and good vendor discounts to practices. However, GPO discounts usually apply to only a fraction of the items you use. The contracts are typically presented through a series of preferred manufacturers and vendors, and it is incumbent upon the end user (you) to do the purchasing, access and monitor the contracts. MedCost does the work for you! It is the ongoing management of the GPO portfolio that keeps the pricing down. 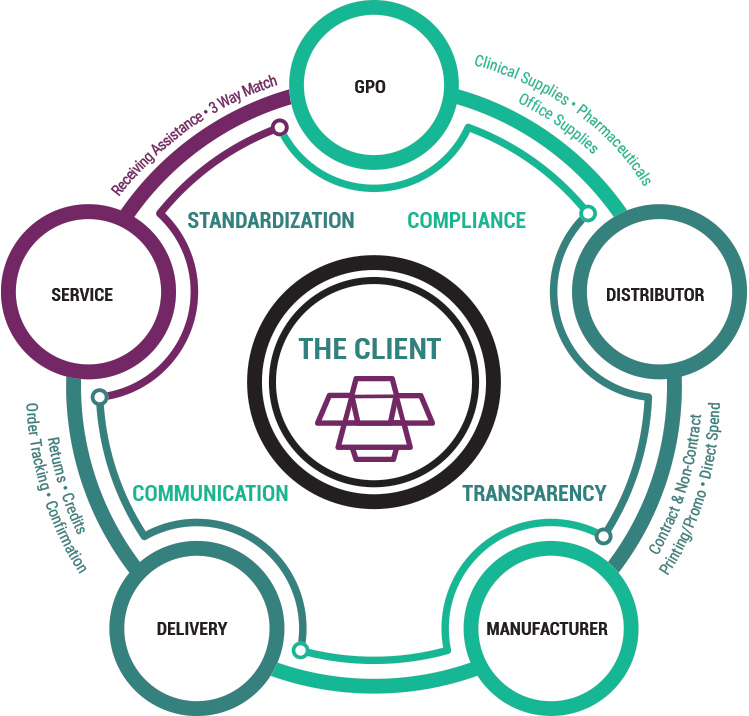 MedCost is GPO neutral and can manage any contract portfolio. MedCost accesses a health system’s preferred contracts but uses distributors who specialize in servicing non-acute facilities. Where there are gaps, we access our custom contracts or negotiate best price. In the absence of any client contract affiliation, MedCost provides an aggregation model. over time is our specialty. MedCost is the most comprehensive procurement program available for the non-acute physician market. We follow each order from requisition to delivery and beyond. Need to track or return an item? Need help locating a product? We are here to help. One call does it all! We handle all transactional details for you. Here are some of the extras included in our program. Our team keeps your licensure current with the vendors to ensure no interruption to clinical deliveries. We set up and maintain all accounts with our vendors and the applicable GPO. We keep the accounts current, arrange for address, physician and name changes. We make sure you are correctly rostered to your affiliated GPO or to the MedCost aggregate GPO. We also attach you to the best contracts that correspond with your usage or system wide continuum of care. We follow up on each order to confirm accuracy of pricing, availability, shipping and delivery dates. We track all backorders and any late or missing orders for you. You don’t even need to ask. Receive a damaged or incorrect item? Just contact us! We will contact the vendor to initiate the return and notify you of the preferred method of return. We work with vendors to ensure credit memos are issued for returns and pricing discrepancies. We can assist with completion of all components of the 3 way match, from purchase order, receiving to invoice reconciliation, we can help. We can run standard usage reports as needed but can also offer customized reports to fit your needs. We have been using MedCost as our outsourced purchasing solution for many years, and continue to be impressed with their ability to procure exactly what we need at the best prices. Their unobtrusive, ongoing analysis of our practices and of the healthcare market has been an invaluable asset.